This box of 12 get well cards is produced by Studio Q and is blank on the interior. Each card measures 4.5x6.5 inches and is printed on cardstock. The set includes 12 cards and 12 envelopes. The cards have the following special features: full color interior, die-cut. 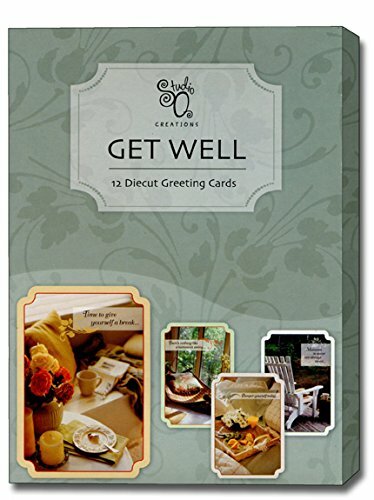 Unique die cut corners create a wonderful curved design on each of the get well cards in this 12 card assortment. Featuring photographs of relaxing places like a sitting room, hammock and adirondack chair, these cards are a perfect reminder to relax and restore. The collection includes 3 each of 4 designs along with 12 white envelopes. Each card is individually priced at $2.75.